Blended of Citronella, Fresh Mint and Lemon. Our Beach Buggy Bug Spray is a special blend of citronella, fresh mint and lemon that’s proven to keep those pesty bugs away. Beach Buggy’s formula was created to repeal bugs and insects away at the beach, around the pool and in the backyard. Keep those pesty bugs away!As part of our aromatherapy body spray collection. 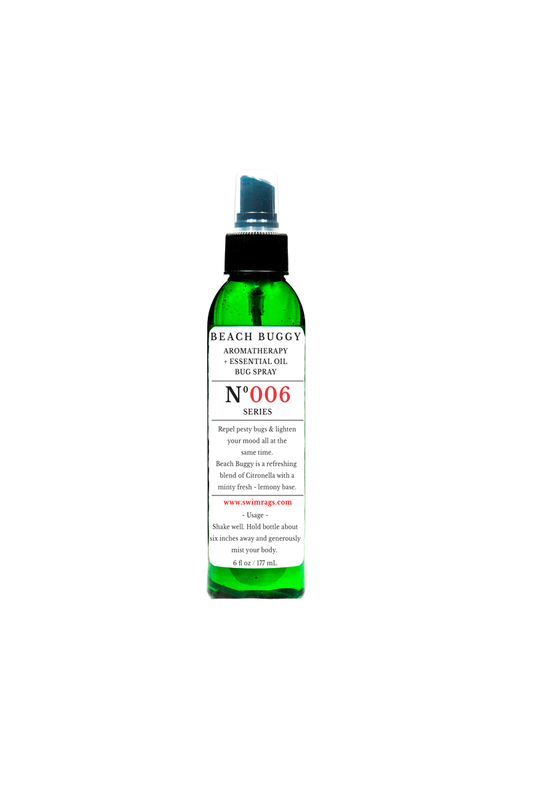 Beach Buggy Spray is tough on bugs yet gentle and pleasant on you and your loved ones. While keeping away the bugs it helps to lift your spirit and enlighten your mood. Indulge yourself with an authentic aromatherapy experience, designed to relax you in a way that only mother nature could match. AROMATHERAPY SERIES No. 006 – Uses Our Salon Quality Aromatherapy ~ Essential Oil Aromas along with natural soy proteins and infused with a hint of soybean oil. These natural ingredients help to bring back balance, restore energy and soothes our minds.